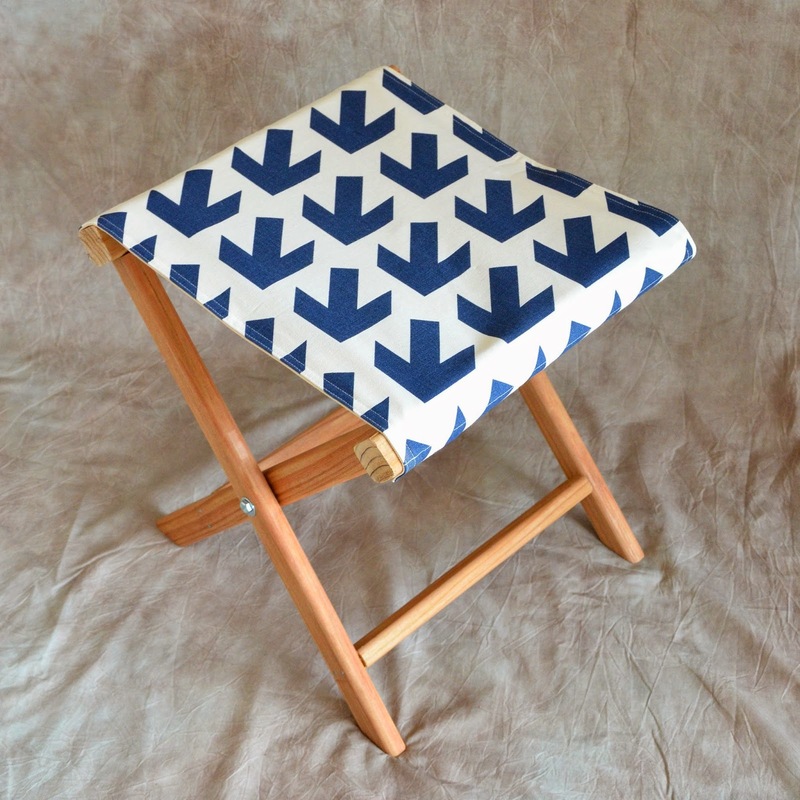 Here's the guest tutorial I mentioned yesterday: a DIY folding stool made from scratch! 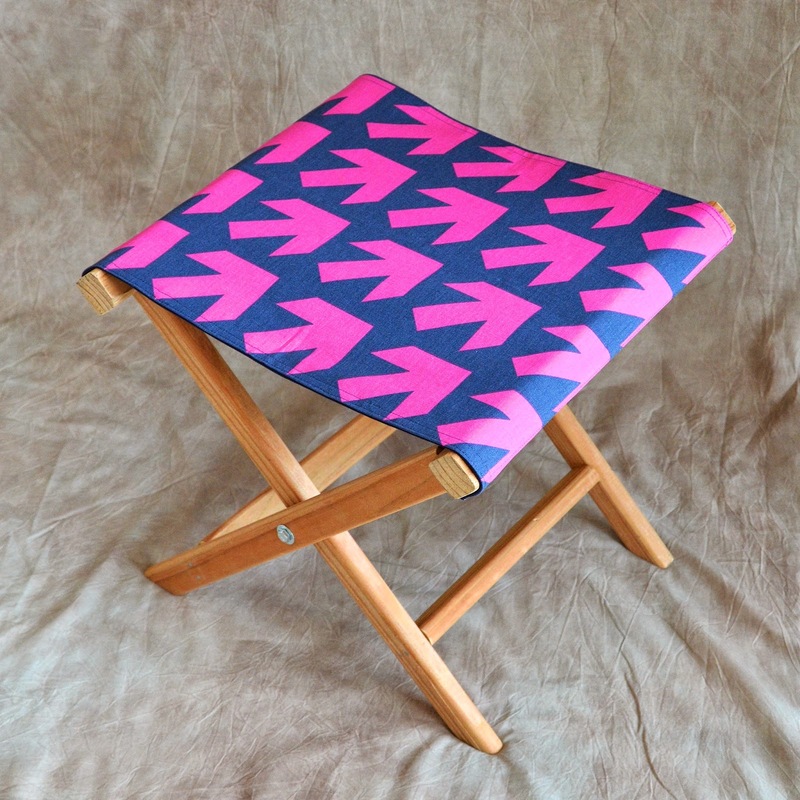 This project uses more of my new Arrow fabric and makes a great side table, footrest, or portable seat. Here's LiEr to tell you how to make them. Hello! 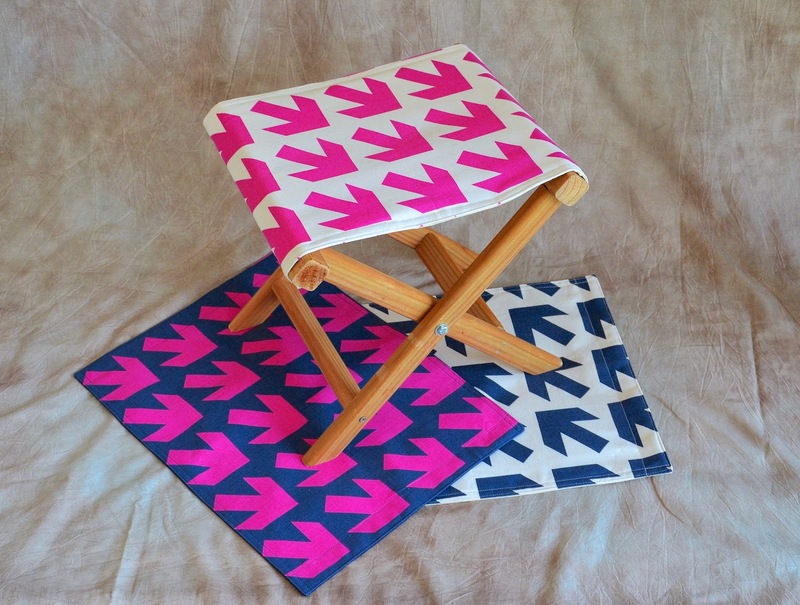 I am LiEr and I write a craft blog ikatbag that is part fabric, part cardboard and, occasionally, wood. 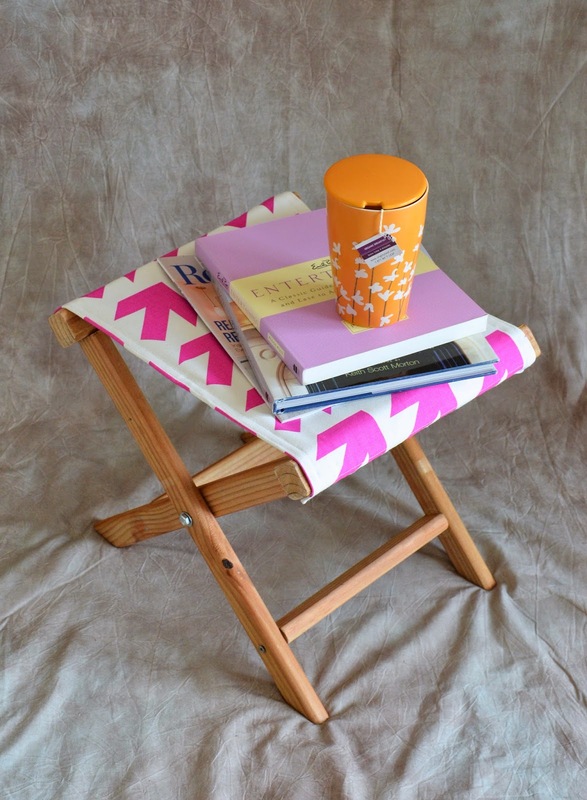 Today, I am happy to be here sharing how to make these little wooden fold-up stools. 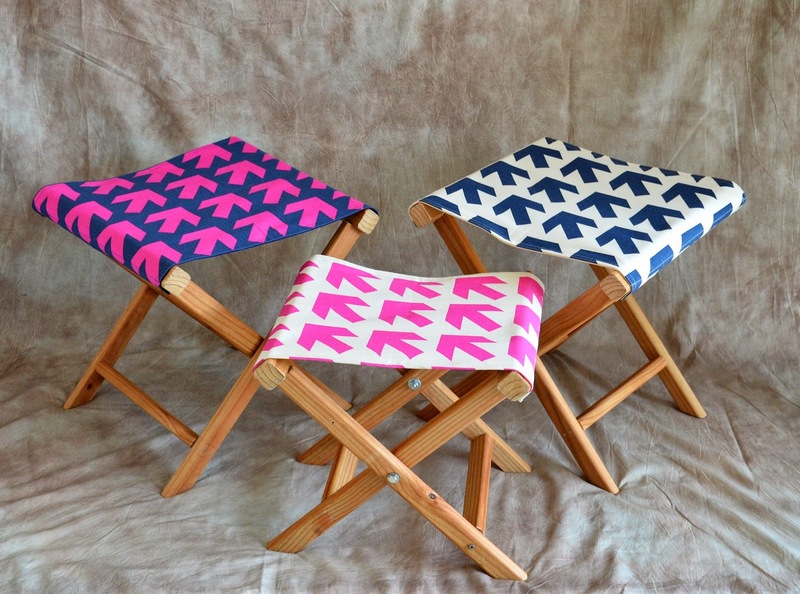 I made these stools in Jessica's new Arrow fabric for my three girls, in two sizes. The smaller one is for my 6-year-old and the two larger ones are for my almost-8 and almost-10-year old. 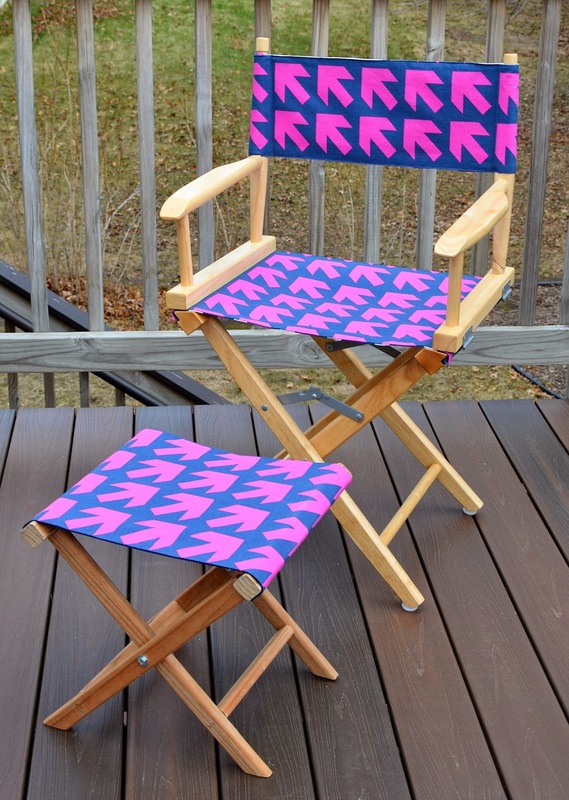 They also make good footrests for the director's chair in yesterday's post. follow the dimensions in the diagram below. 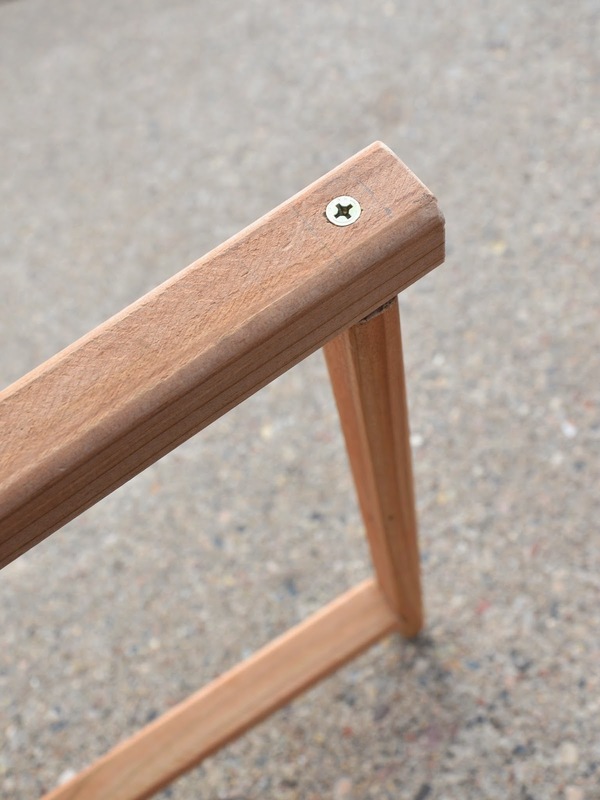 The hardware for both stools are the same. 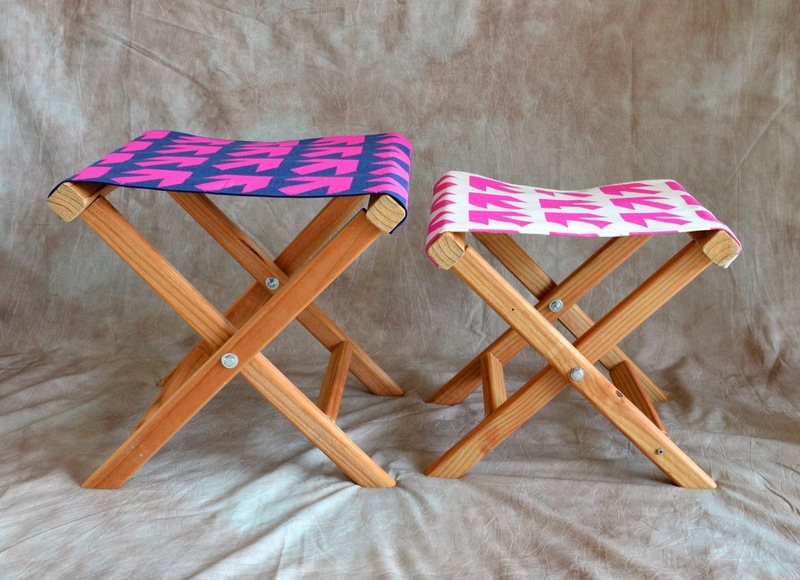 We'll be making the stools in two parts - the wooden frame and the fabric seat. 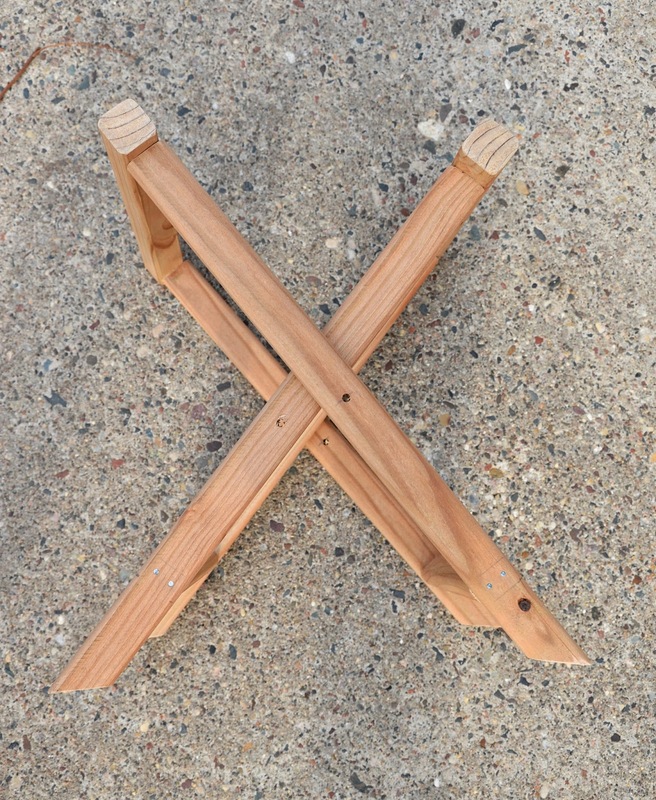 I used lumber in two sizes - 2X2 for the side beams and 1x2 for the legs and cross bars. 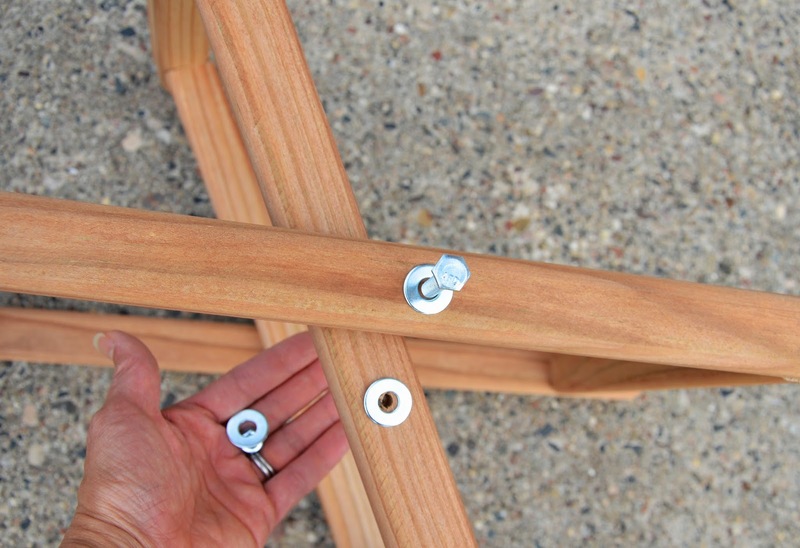 The thicker wood is sturdier, but the thinner legs folded more compactly for the kid-sized chairs. 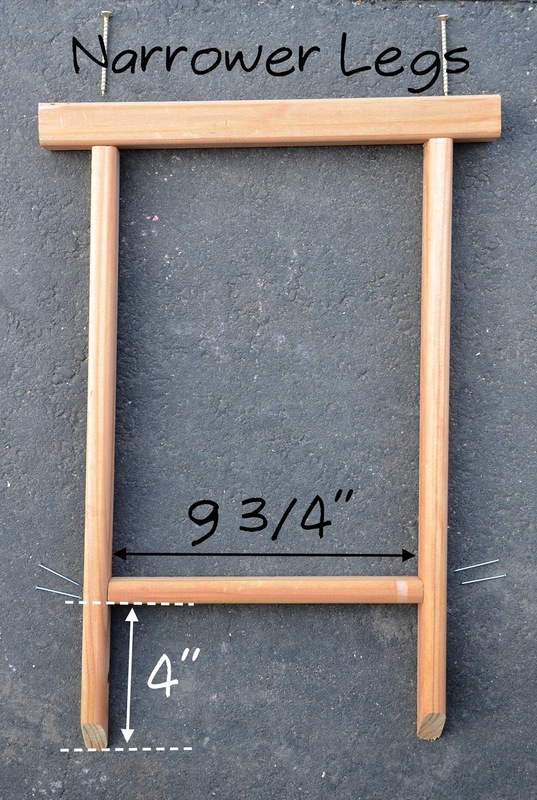 If I were making this in a larger size for an adult, I'd use 2X2 lumber for the entire frame. Cut away one end of each of the four legs at a 45 degree angle. 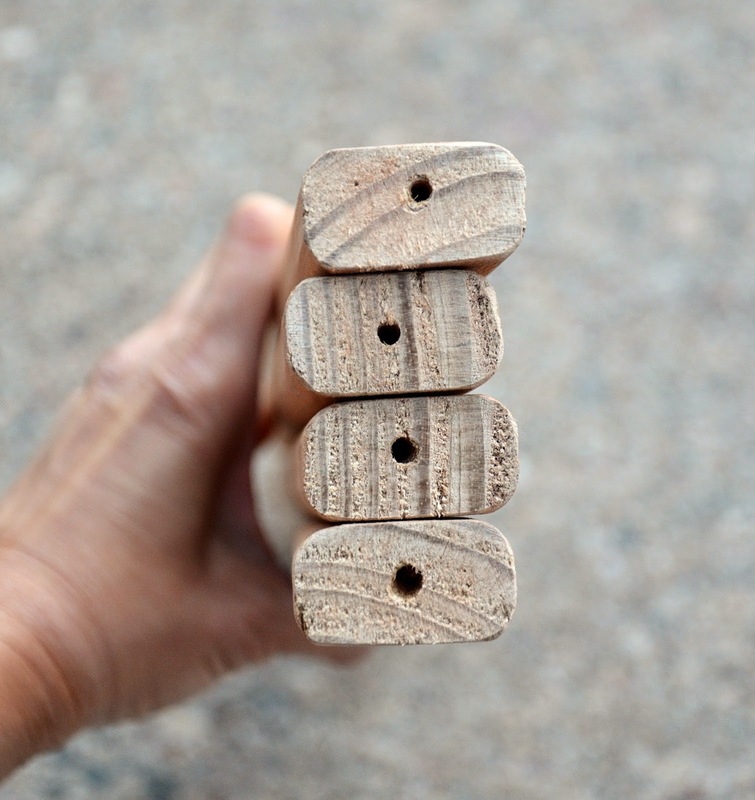 first, holes for the bolts, 9" from the flat ends. 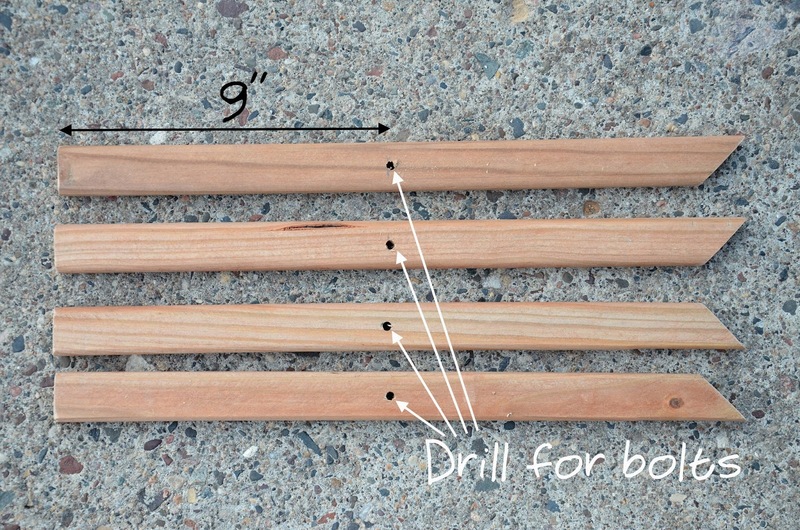 Next, pre-drill holes for the screws, centrally (or as best you can) through the flat ends. 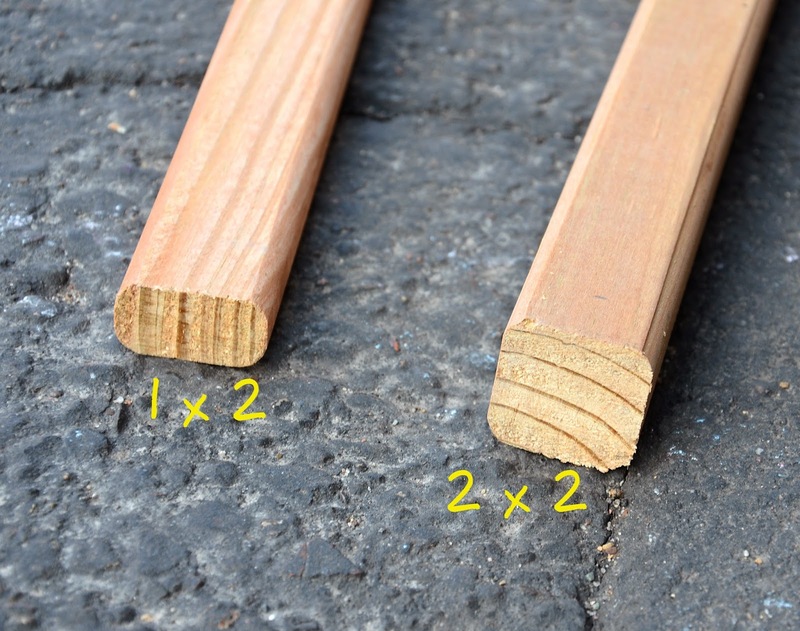 Gather two legs, the 11 3/8" cross bar and the 14" side beam with the 12" screw spacing. 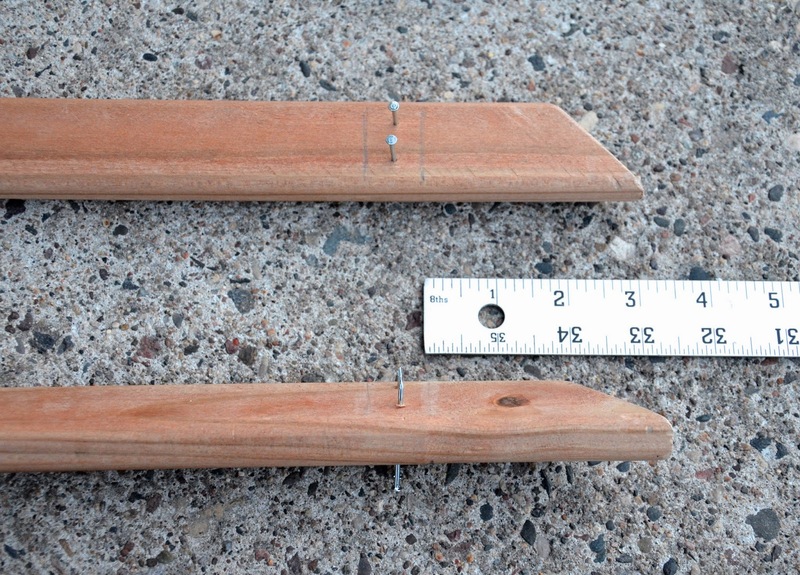 Using the measurements in the photo above, assemble the leg system according to the photo below. 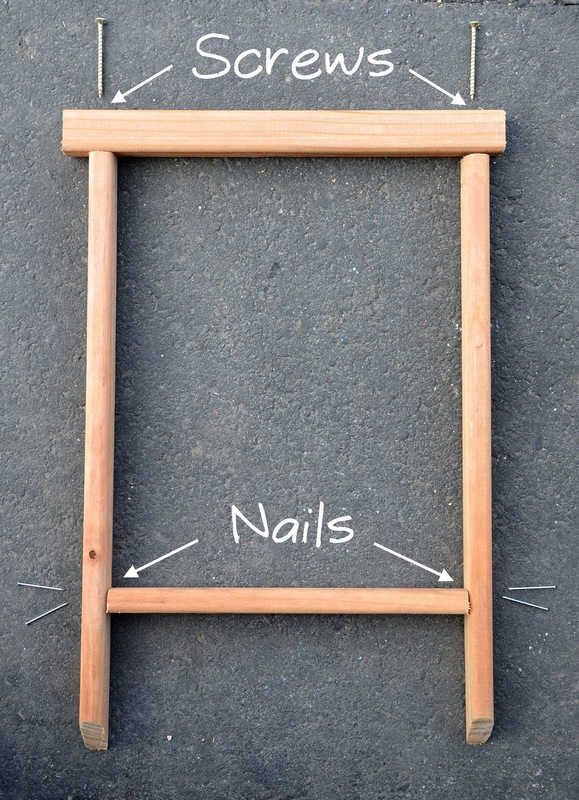 Apply wood glue to the surfaces in contact before inserting the nails or screws. 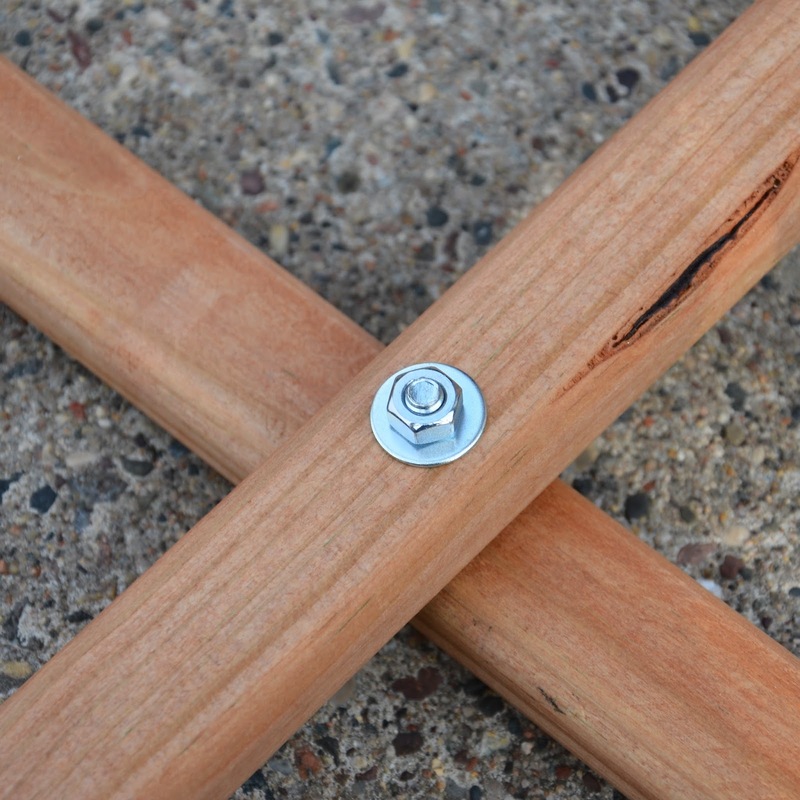 I found it helpful to partially hammer the nails in position through the legs before attaching the cross bar. and then the side beam (the one with screws). 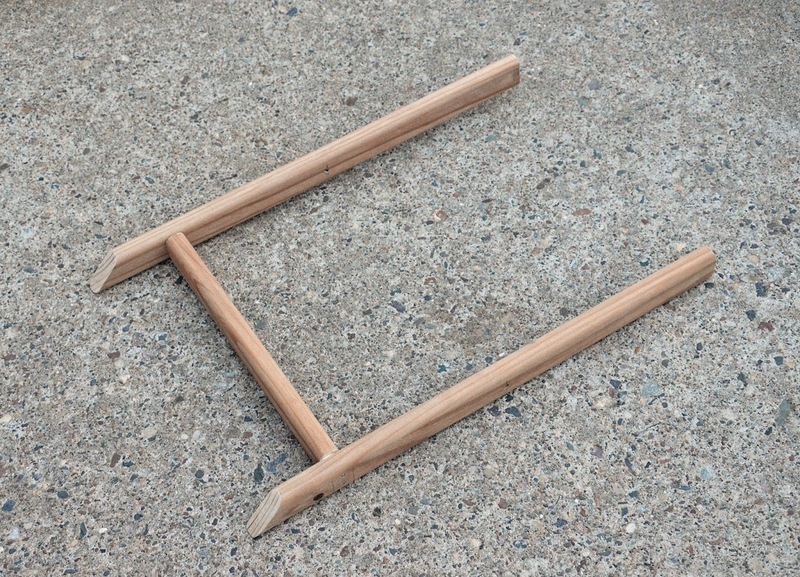 Gather the remaining pieces of lumber: two legs, the 9 3/4" cross bar and the 14" side beam with the 10.5" screw spacing. 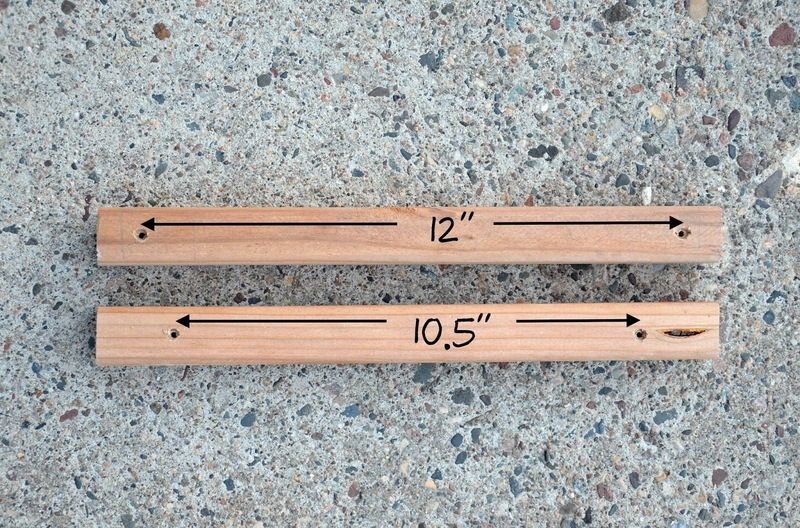 Assemble the narrower leg system in the same way as the wider one, noting that the cross bar is now 4" (not 3") above the pointed ends of the legs. 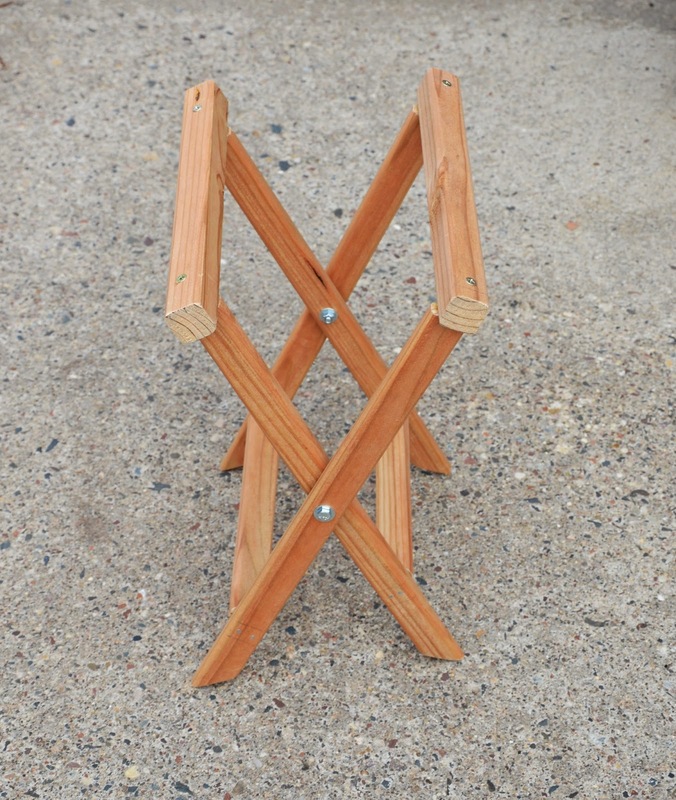 This is to allow the two leg systems to nest within each other when the stool is folded closed. 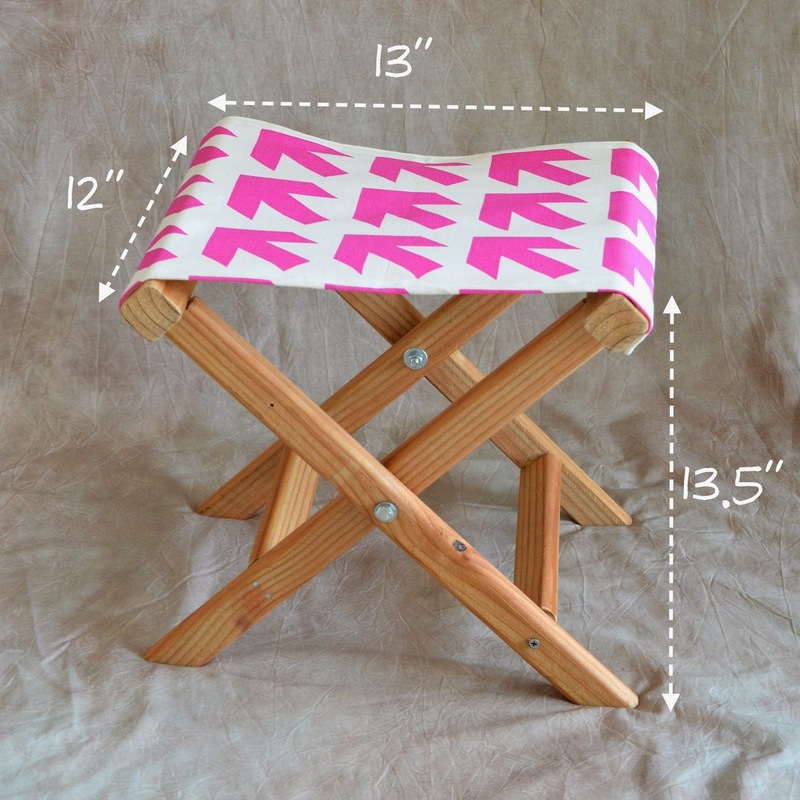 Nest the narrow set of legs in the wider, with the pointed ends in the correct configuration for the stool to stand squarely on the ground. 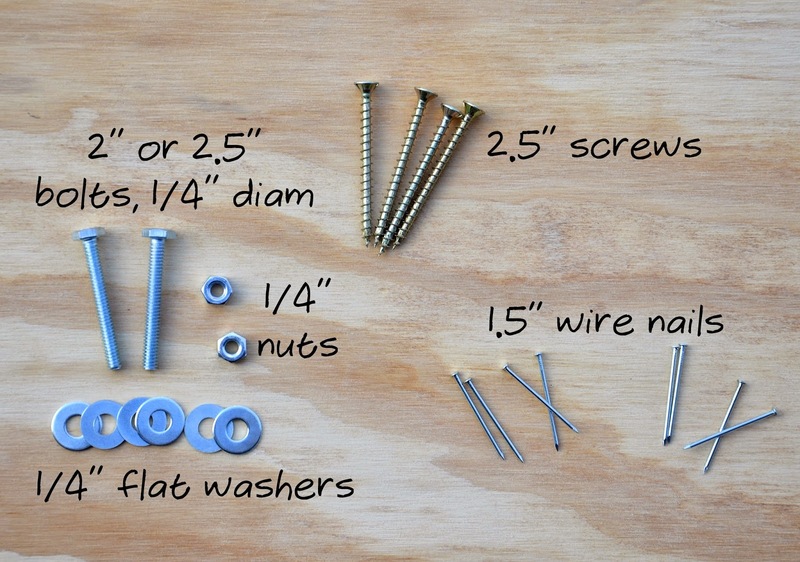 On each side, line up the bolt holes and insert bolt, washers and nut in the following sequence: (from top to bottom): bolt, washer, wider leg, washer, narrower leg, washer, nut. Secure tightly with the nut on the bottom. This is the finished frame. 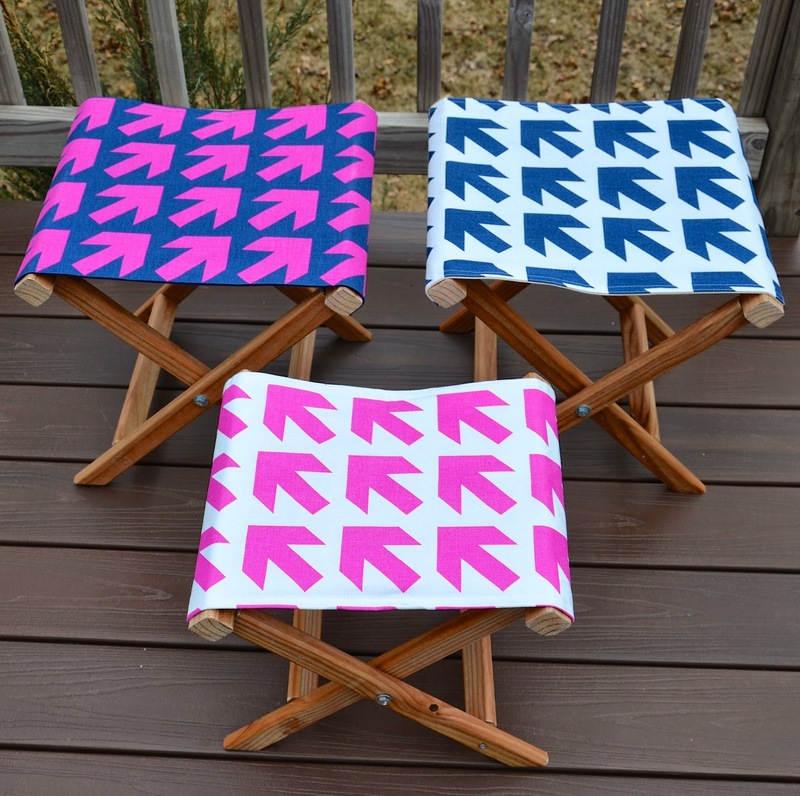 Leave to dry overnight, while you work on the fabric seat. Assemble and pin a fabric sandwich as shown in the photo below. First, centralize and pin the stabilizer to the WS of the top fabric so that there is a uniform 1/2" border all around. 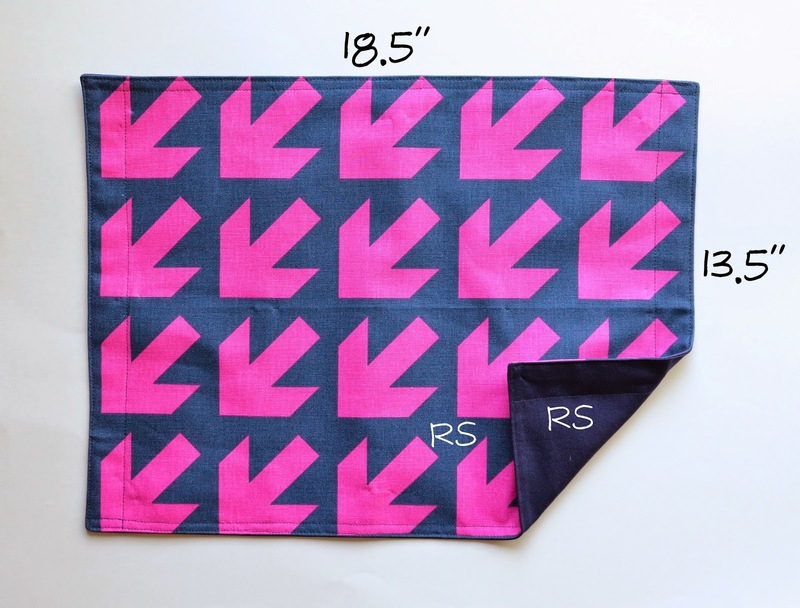 Next, pin the bottom fabric to the top fabric so that their RS are together and their edges are aligned. 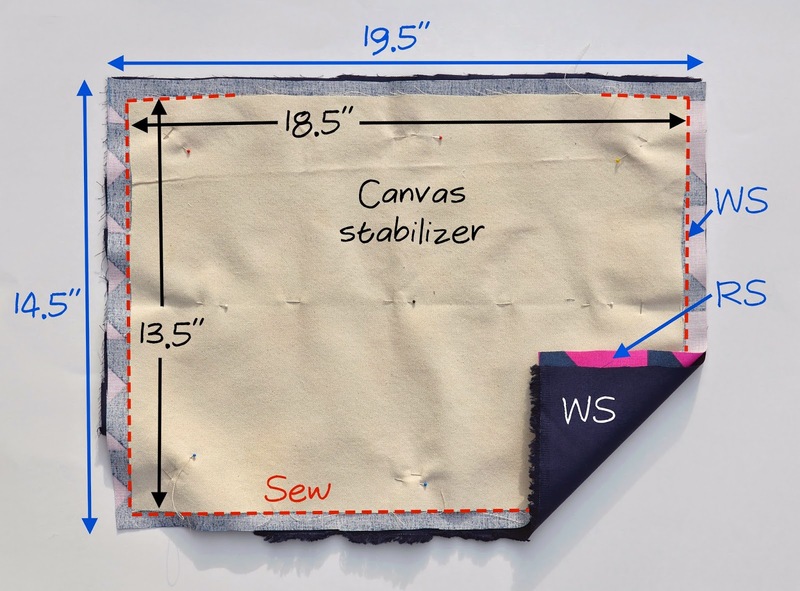 Using a 1/2" seam allowance, sew around the edge of (but not on) the canvas stabilizer, through both the top and bottom fabrics (red dashed line). Leave a large opening (about 10") along one of the long sides, for turning out. Clip the corners and turn the entire fabric sandwich RS out so that the canvas stabilizer is entirely enclosed. Manipulate its corners within the sandwich, if necessary, so that it lies flat and does not bunch up. Press all seams. Edge-stitch around (i.e. sew about 1/8" away from) the edge of the sandwich to flatten the seam. Topstitch an additional line about 1/4"-1/2" from the edgestitching, to securely "catch" the layer of stabilizer between the two outer fabrics. 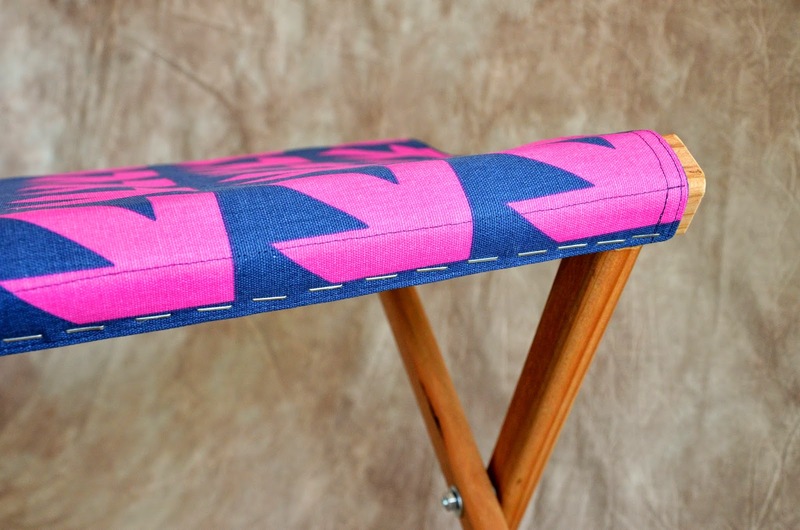 The fabric seat is finished and ready for the frame. Note for non-sewers: if you had sized your frame accordingly, you could even skip the sewing altogether by using store-bought placemats! 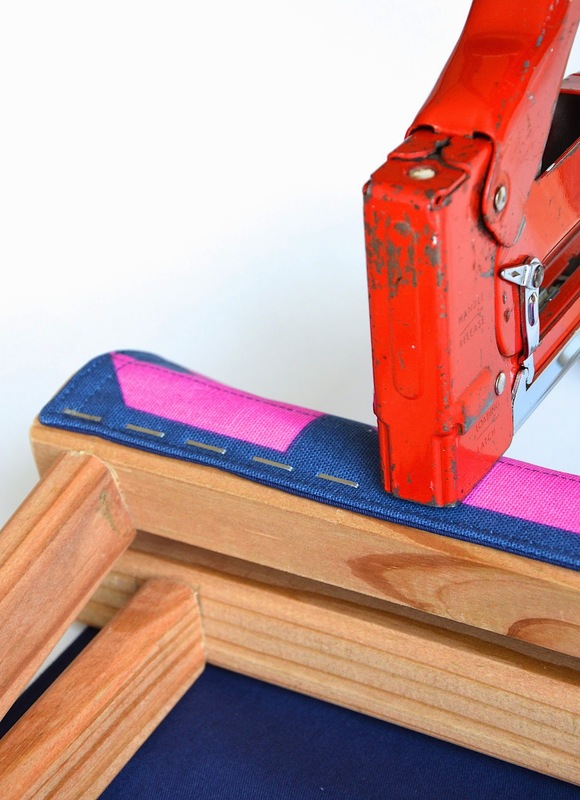 With a heavy-duty staple gun, wrap the shorter side of the fabric seat over the side beams of the frame and staple the fabric to the wood. This is awesome - love them, and they are perfect for kids. 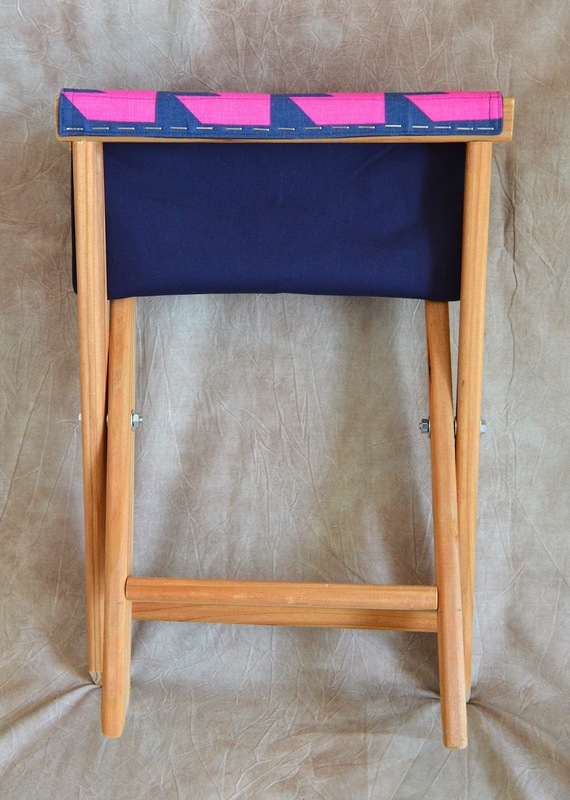 I wonder - if you took out the stabiliser, and made the fabric part really long so it drapes down inside the frame, it could be a magazine holder? I need one of those! It seems like it, doesn't it? I love that idea! 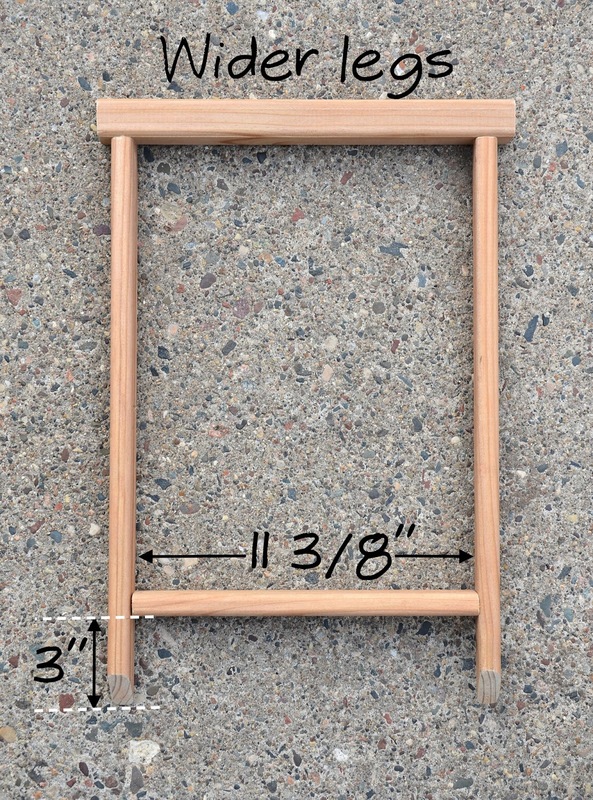 The plans have already been shown to my husband (in a..can you rustle me this frame up?..kind of way). These are great! I'm loving this fabric even more. 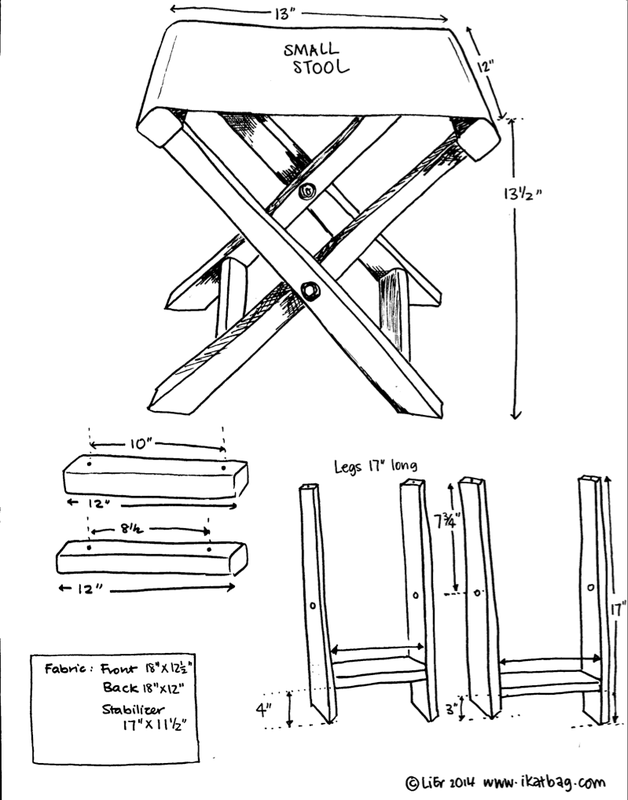 Man, I wish I was handier with the tools to make this one myself. On a side note: cute tea mug! Where'd you get it? This is fantastic! Thank you so much for sharing. Just sent the link to my husband, too. I think the two of us could whip some of these up in a jiffy. Thanks, again! But also...where'd you get that tea mug??? Very in depth tutorial. 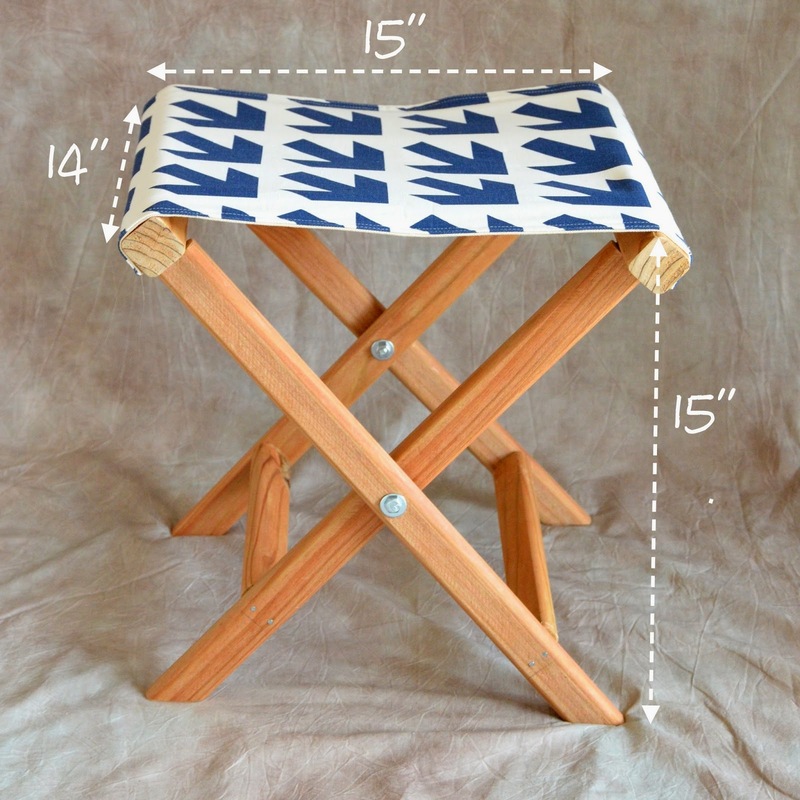 I am looking to create a small fold up table and I think I can alter this to do just that! 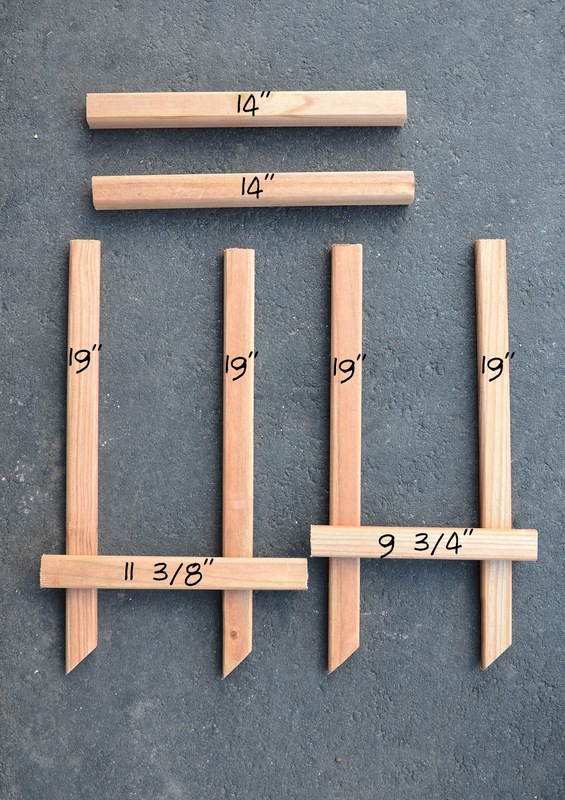 Easier and probably stronger design at Lowes DIY. But it does not show bolts with washers that I think are good idea. How much weight is this able to bear? Anonymous: the husband (I don't know what he weighs but he's about 5'8"/9" ish) sits on those stools every fortnight or so while I cut his hair, and they've held his weight well. ohh, this tutorial is great! Thanks a lot for that! Don't staple sew! This is a safty tip. These are so adorable! Im wanting tho make one for a back packing trip but don't want tho add too much eight to my pack. how much does the bigger chair weigh? Thank you!! Anonymous (May 18 2017): I just weighed it: just under 3 pounds. Where do you buy lumber? 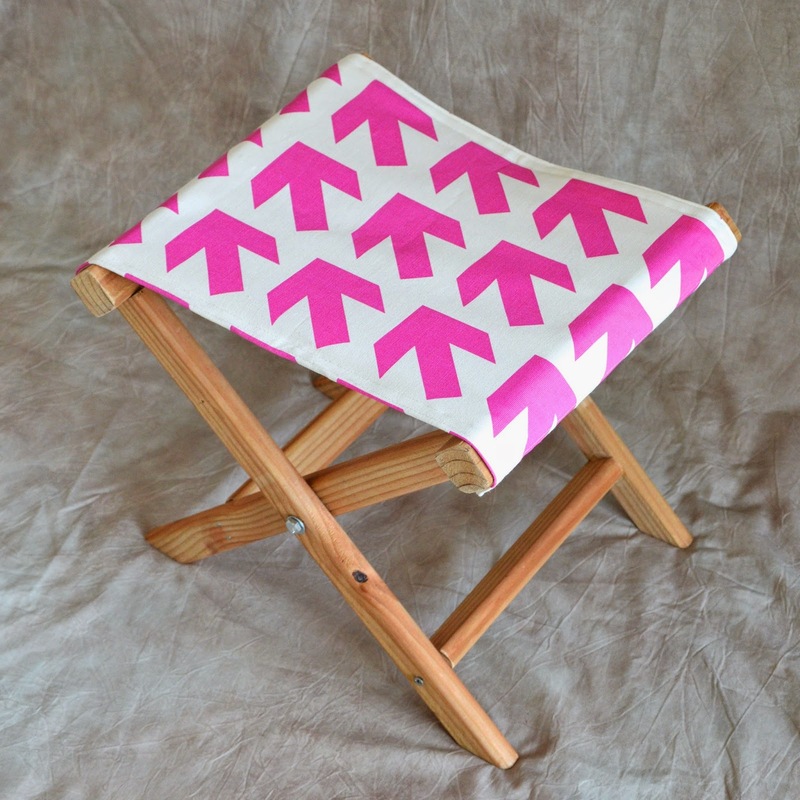 The stuff at the big box stores is such poor quality, I don't know if I would allow an infant to sit on chair made from their 1x2s and 2x2s.